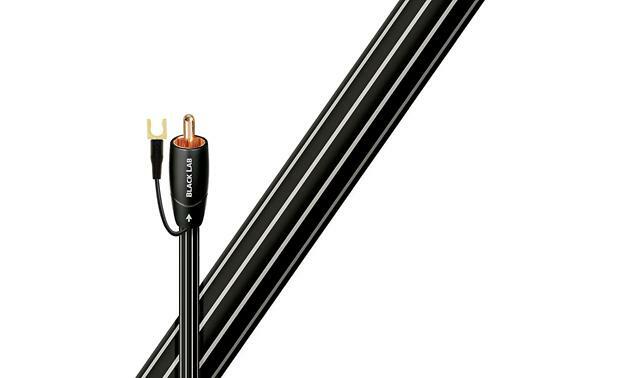 AudioQuest's Black Lab cable delivers all the deep bass goodness your powered subwoofer is capable of. By buying this product you'll earn up to 58 Rewards points. 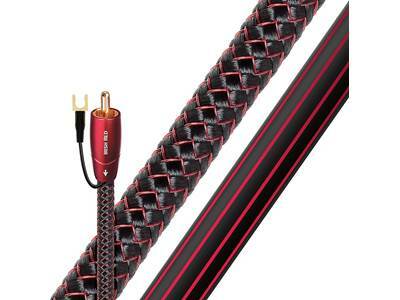 AudioQuest's Black Lab cable delivers all the deep bass goodness your powered subwoofer is capable of. This cable features two identical conductors, and each conductor is a single, unbroken strand of AudioQuest's high-purity Long-Grain Copper. 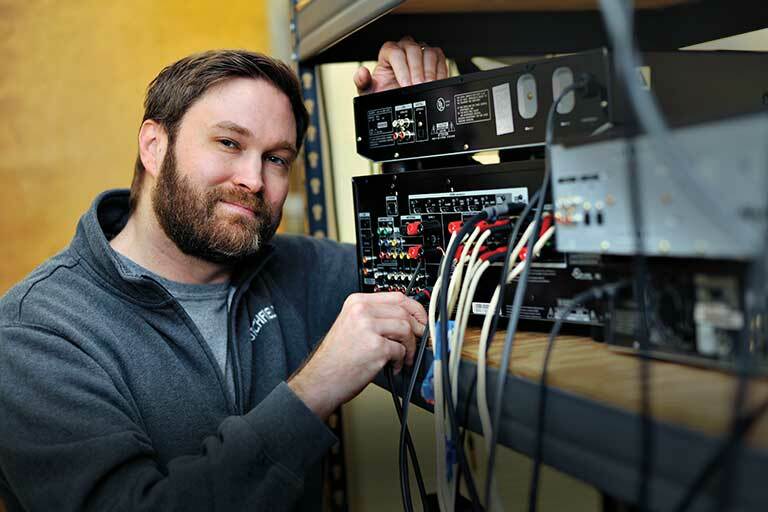 Solid conductors eliminate electrical and magnetic interference that can make multi-strand conductor cables sound brittle. Black Lab features RCA connectors made of gold-plated copper. The connectors are fastened by cold welding — a solder-less process that uses high pressure and silver paste to minimize signal loss. By contrast, solder tends to impede the signal, and heating the copper conductor can negatively affect its performance. Great cable, it eliminated the (ground loop) hum on my previous cable. The length of 26 feet was catching a lot of RF static. Just be sure to use the grounding wire for best performance. Is this one or two cables per order? My setup is the Klipsch 120SW which requires two RCA style connections. This is a single RCA cable with a single ground wire attached. Solid Long-Grain Copper (LGC) Conductors: Solid conductors eliminate strand-interaction distortion. 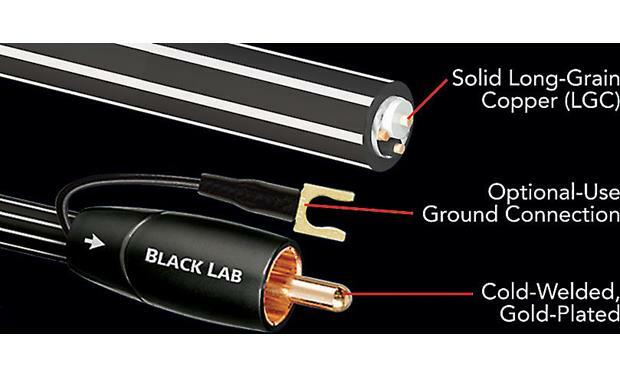 Black Lab's solid Long-Grain Copper allows a smoother and clearer sound than cables using regular OFHC (Oxygen-Free High-Conductivity) copper. OFHC is a general metal industry specification regarding "loss" without any concern for distortion. LGC has fewer oxides within the conducting material, less impurities, less grain boundaries, and definitively better performance. Foamed-Polyethylene Insulation: Black Lab uses air-filled Foamed-Polyethylene Insulation on both conductors because air absorbs next to no energy and Polyethylene is low-loss and has a benign distortion profile. Thanks to all the air in Foamed-PE, it causes much less of the out-of-focus effect common to other materials. Is this cable acceptable for in wall use? The cable is perfectly acceptable, but the problem will be snaking the thick cable through the walls. So unless you are addressing new construction or a substantive remodeling job, you might want to consider cable raceways or channels. Hi Aaron, Yes it is. Unfortunately I had mine go bad but they come with a five year warranty. So I sent it back to audio quest and they sent me another. I have two but of course the one that went bad was the one in the wall. I hope this helps. Don. Yes it is. I pre-wired my house with two of these for my theater. Just remember not to run the wire parallel with the electrical in your home. I used it in the wall and it seems to work just fine. I Put it inside my wall and haven't had any problems with it. Can you use this for center speaker pre-out? Sorry for the delayed respond. I'm guessing you. I would think the connections are the same. I only use it for my sub but it works like any other audio cable. Yes. I use it for my center speaker. This is a single cable. If I understand you may be looking for a pair of rca cables and this is not them. Happy audio-ing! This is a single subwoofer cable. For the Klipsch 120sw you would need to use an RCA Cable. Just one cable with one connector as shown on each end. It is only one cable. Double check to make sure you need 2 cables. My Polk PSW110 only needed one. What direction should the arrow be pointing when hooking-up a subwoofer? I have an old Pro 800 DT sub. I see no ground location on it. What do I connect the ground to? Or is grounding something newer subs will have? Some equipment requires a ground, some don't. If you don't have ground posts then you probably don't need them. My new Klipsch subs don't have ground posts either. If you needed it, you would know what to do with it and where it goes. Get a subwoofer cable that sounds and looks better. Searches related to the AudioQuest Black Lab Subwoofer cable.